Ladakh is often referred as the land of high passes where gargantuan snow capped mountains offer encapsulating vistas. While the mountains can seem intimidating, numerous panoramic lakes which also form an integral part of Ladakh’s landscapes are absolutely serene and ethereal. Many of these high altitude lakes are sparsely populated and home to the nomadic Changpas who roam around with their yaks. While Pangong Tso and Tso Moriri are the most popular ones, there are more lakes in Ladakh, some which are known only to the locals. With multiple shades of blue shimmering against the brown mountains and blue skies, these lakes look surreal and are a major attraction in Ladakh. Permits are required to visit Pangong Tso, Tso Moriri and Tso Kar, and it can be obtained from DC office in Leh. Pangong Tso is probably the most visited lake in Ladakh and its popularity can be attributed to the movie, 3 Idiots which was shot here. With a length of 134 Kms and located at a height of 14,764 feet, it is the largest saltwater lake in Asia. Apparently, only one-third of the lake lies in India and the remaining two-third is geographically a part of Tibet. The electric blue colour of the lake stands out amidst the brown mountains in the background to form gorgeous frames from all angles. Pangong Tso comes under the Changthang cold desert sanctuary and is home to a few avian species. 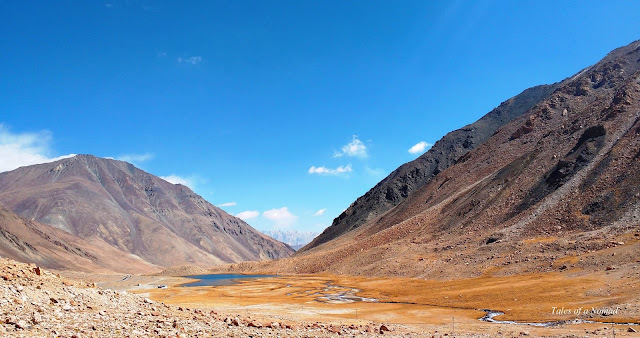 While coming from Leh, it is a strenuous climb to Chang La, the third highest mountain pass in Ladakh, and then descends through the mud tracks to Pangong Tso. The first glimpse of the lake through the barren mountains is an eye popping one, and slowly the humongous lake spreads out with myriad shades of blue and green. The first village you hit is Lukung and further ahead is Spangmik village. Both the places have numerous restaurants and options to stay. 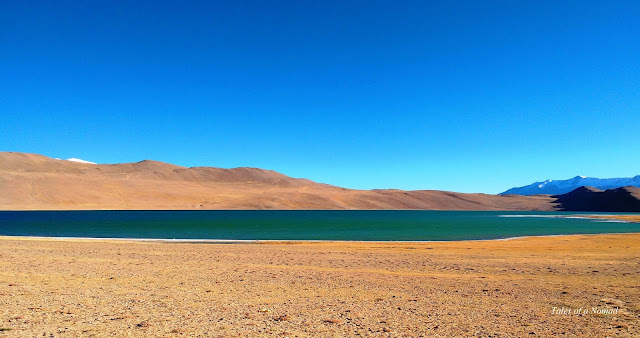 Pangong Tso is 170 Kms away from Leh and can also be covered in a day without a night halt. Tso Ltak can be spotted from a distance as you ride towards Pangong Tso. A speck of blue amidst the brown mountains is all that you can see, but slowly opens up as you near it. Located at a height of more than 16.600 feet, the lake is just a few kilometers ahead of Chang la pass and appears on the right as you ride down. The lake is small in comparison with the other popular lakes of Ladakh and is often skipped by visitors while heading to Pangong Tso. One can go boating in the waters and there is also a refreshment shop next to it. Accommodation options are also available here. 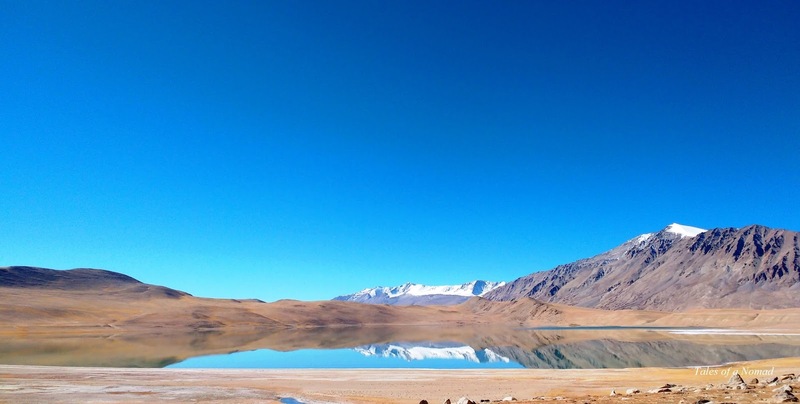 Amidst the staggering 18,000 feet tall mountains, Tso Moriri sits peaceful with various shades of blue accentuating its charm. Stretching over 19 Kms, the brackish lake is located in the Changthang plateau and is the largest lake in Ladakh. With marshes and wetland areas, a part of the lake forms the Tso Moriri wetland conservation reserve. The wetlands are breeding ground to the endangered black necked crane and bar headed goose. Kiangs or wild asses are also sometimes found along the banks of the lake. Located 240 Kms to the south east of Leh, it is a long ride along Indus river and past villages such as Mahe and Sumdo to Korzok, the closest village to the lake. A couple of kilometers away, the open lands are home to the nomadic Changpas who live with their herd of yaks. Korzok village also has a monastery, Dupgyat Tantar Chhosling monastery which offers nice views of the lake and the surrounding areas. As the evening sets, moonrise over the expansive lake and the towering mountains look gorgeous. Korzok village has numerous small eateries and budget options for stay. Temperature here plummets often to sub zero degrees at night. 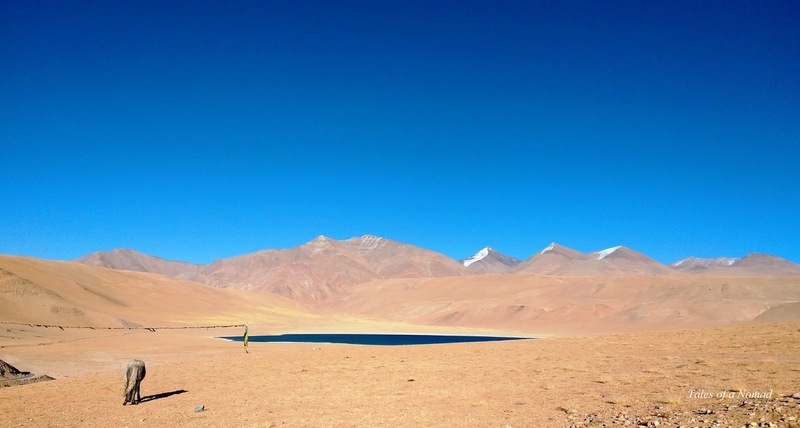 Located at a height of more than 14,949 feet, Tso Kar is situated to the north of Tso Moriri. Another home ground for the Changpas, the lake gets its name from the salt pans present along its banks. Surrounded by mountains and salt pans, the light blue coloured salt water lake is 9 sq kms in size. The lake is made up of two water bodies- Startsapuk Tso and Tso Kar, and is home to a variety of avian species such as brahminy duck, brown headed gull, bar headed goose etc. The route from Tso Moriri to Tso Kar runs through the Changthang wildlife sanctuary and the chances of spotting Kiangs (wild asses) are quite high. Himalayan blue sheep and marmots are also commonly found here. The region was used by Changpas to collect salt and even export them until a few decades ago.There are only a couple of options to stay near Tso Moriri. The monastery near the lake offers panoramic vistas of the surroundings. One is also likely to spot Kiangs near the monastery. Tso Kar is 185 Kms from Leh. As you near Tso Moriri, Kyagar Tso slowly opens up in front of you and spreads itself as the road winds its way around it. 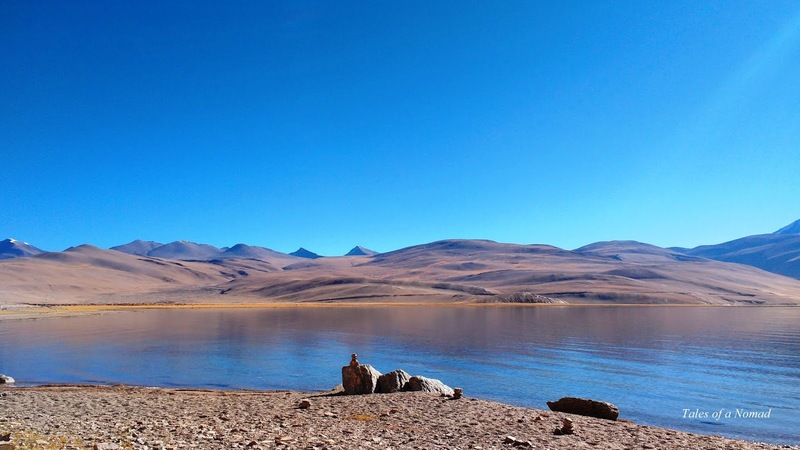 This is a salt water lake and is usually given a miss as visitors are in a hurry to reach Tso Moriri. 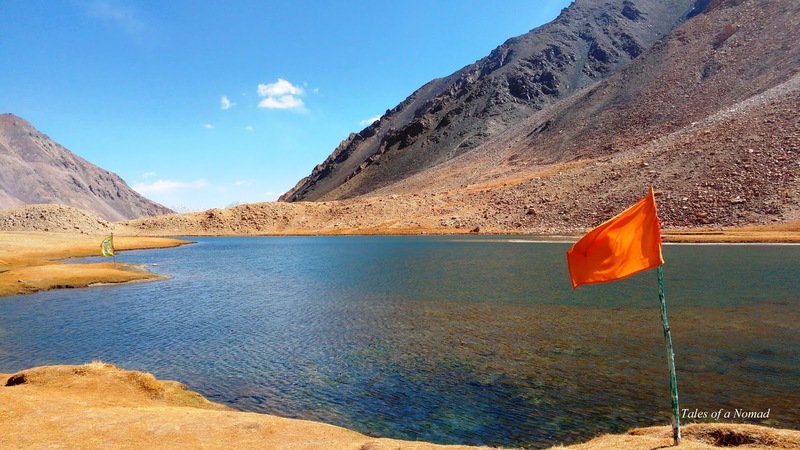 Sitauated at a height of more than 13,100 feet, Kyagar Tso is comparatively a smaller lake but that does not make it less beautiful by any means. The lake has a gorgeous location with snow clad mountains in the backdrop, and is home to nomadic tribes and fauna such as yaks, horses, marmots and sheep. There are no accommodation options available near Kyagar Tso. There are more lakes in Ladakh apart from the ones above and many of them remain unknown. Yeah, well spread out ones.